Atra Vetosus for the first time in Europe! 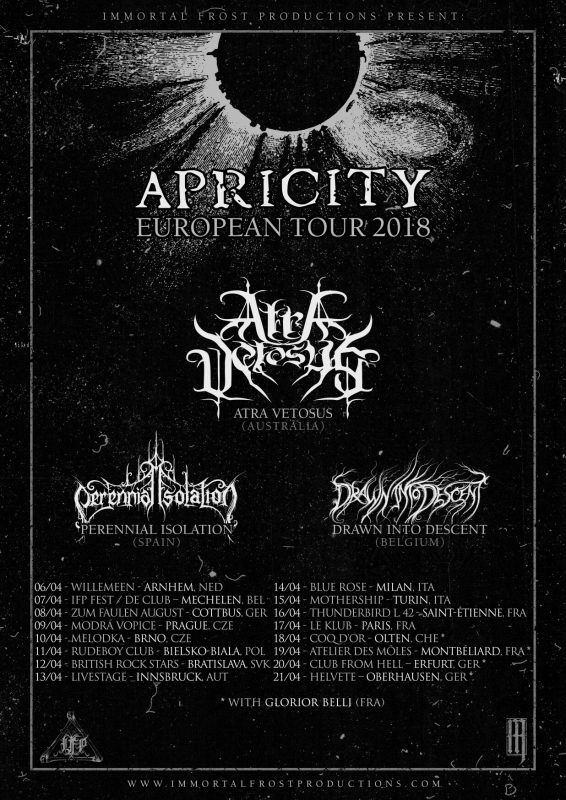 To celebrate the release of their highly anticipated second full length album ‘Apricity’, the Australian Atra Vetosus will bring their atmospheric and melodic black metal to European soil – for the very first time. The tour features 16 gigs in 10 different countries: Netherlands, Belgium, Germany, Czech Republic, Poland, Slovakia, Austria, Italy, Switzerland and France. On all 16 dates the band will be supported by two more atmospheric black metal acts: Perennial Isolation from Spain on the one hand and Drawn into Descent from Belgium on the other. The last four dates will be completed by no lesser than the French Glorior Belli, who will present their brand new seventh full length album “The Apostates”. While some dates feature additional support acts, the tour also features two festival appearances at IFP Fest in Mechelen, Belgium (Tickets) and at Atmospheric Black Metal Fest in Milan, Italy.